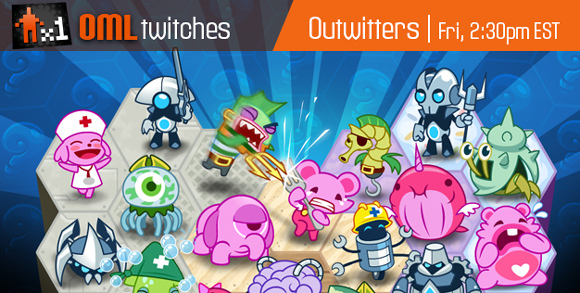 This Friday on a very special OML Twitches: the creators of Outwitters go head to head! Neither of us have played in a good long while, but still we will clash like a couple of newborn babies. Help Alex scout and overcome my army for a shot at a free copy of Space Food Truck, which will pour forth from my base for every point of HP damage I take. Stream starts Friday at 2:30pm EST , and the rerun will be up on our Youtube shortly thereafter. The reason I ask is because we’re using daylight saving time now, so I am confused about whether I have to adjust by an hour to get the right time. ah ok. Ya we’re referring to ET: aka whatever is the time on the east coast. Thanks for the heads up!